PLEASE NOTE: The Back Up Trails Guide course is only open to students who meet the minimum requirements. You must posses a valid FGASA Level 1 Certificate and be a paid up FGASA member. On the 22 day Bushwise Back Up Trails Guide course in conjunction with Lowveld Trails Co. you will cover all the necessary requirements to meet the FGASA back up trails guide qualification. Your time will be spent meeting the minimum number of dangerous game encounters, on foot and logging the minimum number of hours required. This course will also focus on the ethos of guiding, as well as bush skills. For Bushwise FGASA Professional Field Guide Students we offer a Back Up Trails Guide Course 12 day add on option. The course is extremely practical and intense, with an average of 7 hours spent walking in a Big Game Area each day. 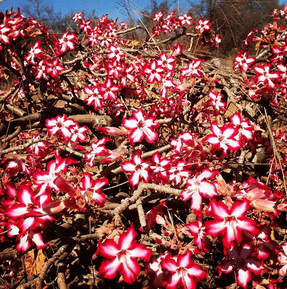 Our basic tented camp is set under giant Jackalberry Trees in the heart of the Timbavati Private Nature Reserve. 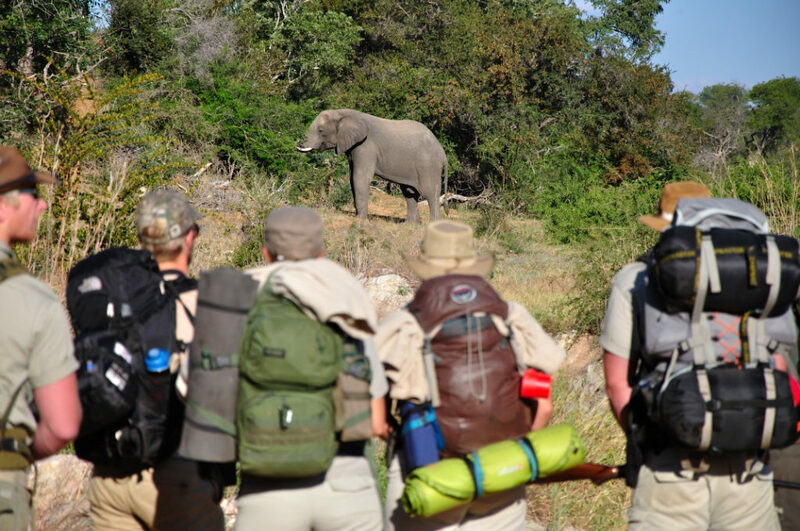 The area is classic Big Game Country, with healthy numbers of ALL members of the Big 5, providing the ideal conditions under which to attain the experience required to kick-start your Trails Guiding Career. You will log priceless hours and Dangerous Game Encounters, under experienced mentors who will guide you through the process of approaching and retreating from Dangerous Game on foot. This experience is necessary in order to be assessed as a FGASA Back-up Trails Guide. A typical day starts with a wake-up call before sunrise. As the birds announce the approaching day, we enjoy coffee and rusks, before heading out on a 4 or 5 hour walk as soon as it is light enough. We return to camp before midday for a well-earned brunch, before daily debrief, a short lecture, or a few hours free to shower, read or take a nap. The lunch bell rings, usually at around 3pm, announcing a light meal, before we again head off into the wilderness for a 2 to 3 hour walk, gaining more valuable hours and encounters. Dinner and a crackling campfire await us back at camp, usually followed by an open air shower and an early night after the exertions of the day. At times we will be walking for long periods in rugged conditions, so students should be prepared to get hot, dirty and sweaty, all part of being a Trails Guide operating in Africa’s Wilderness Areas. 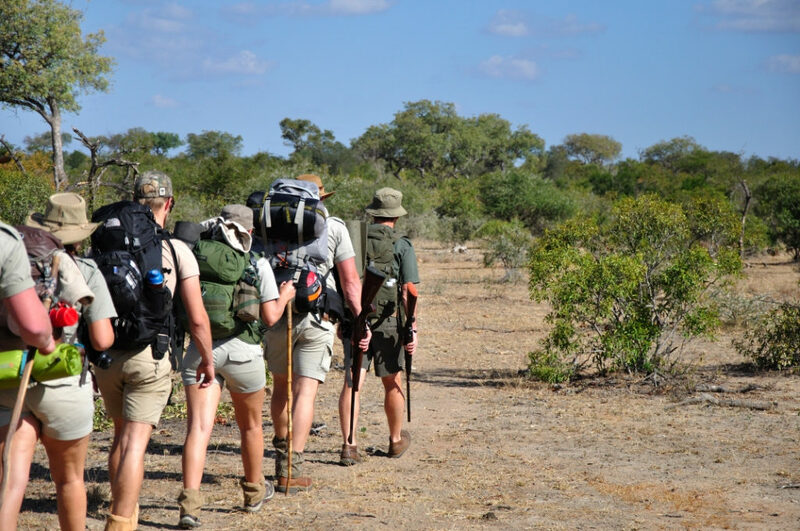 The Back-up Trails Guide Course runs over a period of 11 nights and 12 days in the world famous Timbavati Private Nature Reserve. 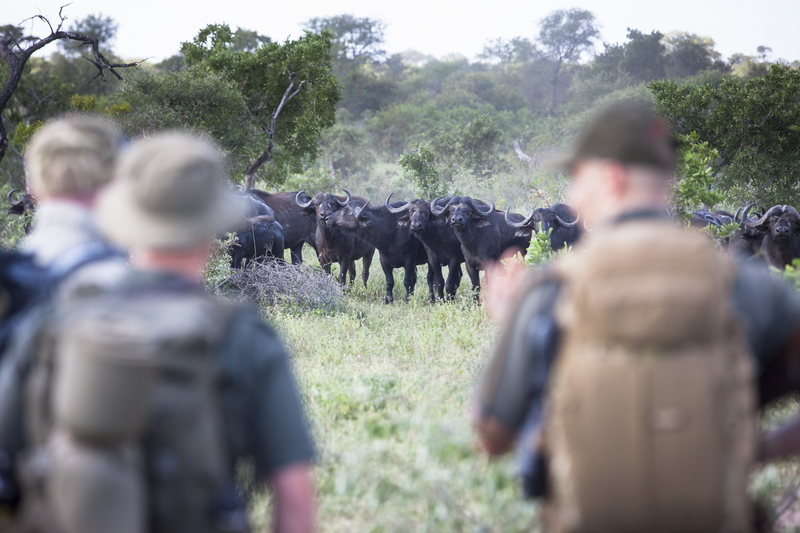 Phase 1 – We spend the first 8 nights at a basic tented camp, walking every morning and afternoon, logging Hours and Dangerous Game Encounters that go towards the Back-up Trails Guide Qualification. Phase 2 – The final 3 nights are spent on a primitive, Wilderness Backpack Trail, during which FGASA Back-up Trails Guide Assessments will take place. There is a Maximum of 8 students per course, ensuring as much first-hand experience as possible as well as maximum attention from the trainers. Students without ARH or the Trails Guide Theory can still log hours and encounters as participants, but cannot carry a rifle and cannot be assessed, although they will participate in all activities. 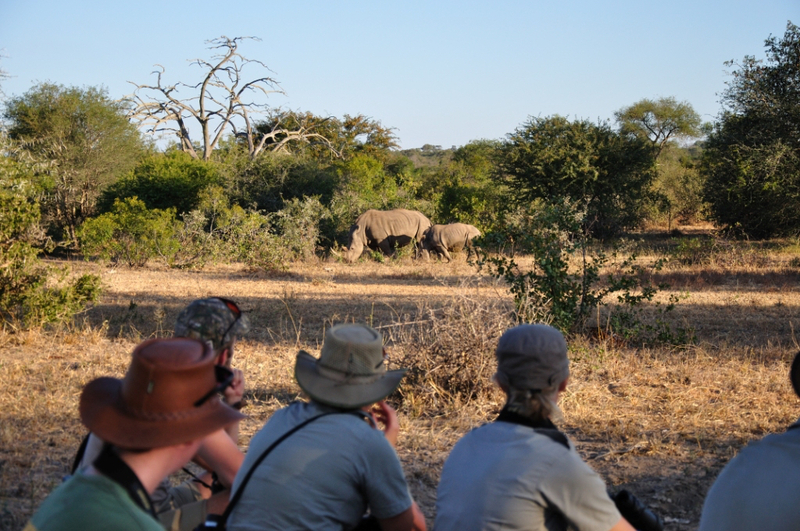 The Goals of the Course are for students to log a minimum of 75 walking hours under an experienced mentor (50 in Phase 1 and 25 in Phase 2) as well as a minimum of 20 Dangerous Game Encounters, including as many different species as possible. This ends up being more than the minimum requirements from FGASA to be assessed for the Back-up Trails Guide Qualification. Although the primary objective is to log hours and encounters that go towards the Trails Guide Qualification, we will also focus on the ethos of Trails Guiding as well as bush skills such as tracking, finding water, holistic interpretation, etc. The last 3 days of the program are spent on a primitive wilderness experience, with no support in the form of a set camp or vehicle. Nights will be spent camping wild, sleeping in the open, under the stars and around a fire, with each participant taking turns at “watch duty”, ensuring the groups safety. All food and equipment are carried in backpacks, and we obtain our water by digging in the riverbeds. This trail component will also serve as the assessment phase of the course, with 2 Assessors and Mentors being present throughout and learners taking it in turns to lead and back the group up. Day 10 – 12 – Backpack Trail plus assessments, concluding at midday on day 12. 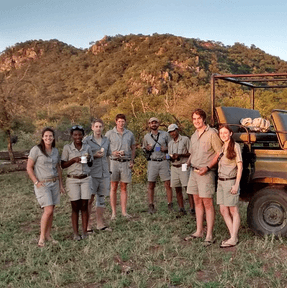 The Trails Guide Course operates from an isolated, mobile, tented camp in the central part of the Timbavati Private Nature Reserve, which is open to Kruger National Park. 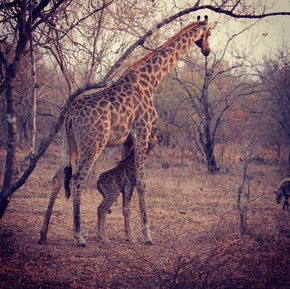 The Timbavati is justifiably well known for its’ high densities of Big Game, with all members of the Big 5 common in our area of operation. The camp, without any fences, is erected under shady trees along a dry riverbed for the duration of the course and is completely removed on our departure, leaving no trace of the presence of 10 people. Canvas dome tents house 2 students each. A mattress and pillow is provided, but bring along your sleeping bag and whatever other bedding you may require. Ablutions are simple, but unmatched. Specially designed toilet seats crouch over long-drops, and canvas bush showers hung from overhead trees, covered by canvas on 3 sides, open onto views of the surrounding bush. The communal area is around the campfire or at the kitchen area where our cook whips up wholesome meals on a gas cooker and an open fire. There is no electricity, wifi or mobile phone signal, allowing us the opportunity to tune into the rhythm of the bush without any distractions. Please also note that the laundry facilities amount to a basin and soap, which are available to students if they need to wash clothing.